Cerro Bayo is a little ski hill that has so far stayed off the radar of the international ski scene. Tucked away in Neuquen, Argentine Patagonia, it is only a short drive from Bariloche but is not well known– yet. Situated above the charming town of Villa La Angostura, there are spectacular views of the surrounding white peaks and blue waters of Lago Nahuel Huapi as well as the cones of distant volcanoes. We heard of Cerro Bayo through a friend who filmed a segment for a ski movie in the surrounding terrain, but the area came close to stealing the show. The ski hill itself boasts some big mountain terrain, wide open easy runs, plenty of fun, entertaining features, spaced out tree runs, and backcountry access to some interesting lines for those with appropriate gear and knowledge. 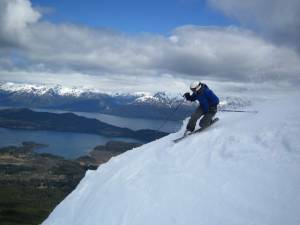 It has a ski school, ski rental, and usual amenities, albeit a little behind the times, but on par with other Argentine resorts. It is a small ski hill, by most standards. The chairlifts are old and slow, and the little on-mountain refugios made of logs. The base area consists of a collection of low key, cute little log buildings that house a bar and restaurant, ticket office, ski school, gift shop, and tiny, obligatory chocolate shop (specialty of the region), connected by little dirt pedestrian roads that are occasionally shared by neighboring cows. Built by a determined Belgian immigrant, the first lift pieces were hauled up in the summertime by dirt bike, and the ski hill operated for decades on a low key, local scale. Recently sold and acquired by Fiducia Holdings, a company with big plans, Cerro Bayo has recently begun billing itself as a ‘boutique” ski area. Prices have gone up quite a bit already, and change is in the air for this little area. Currently, Cerro Bayo is mellower than areas like Las Lenas or Catedral in the party scene. Summer is the big season here, but you can après at the refugio on the hill or at the nice big deck at the base area, and chat with the local skiers. Back down in town, little Villa La Angostura is not the least of the attractions of Cerro Bayo. The town is practically fairy-tale cute, there are plenty of outdoorsy locals and an actual community feeling that is refreshing. The town is dotted with tantalizing chocolate shops, ice cream shops, and restaurants serving meat and fish. As popular summer destination, the culinary offerings are dangerously good for a little town in the middle of nowhere. However, we can only truly recommend Las Varas, since we went there our first night, and it was so good, and our waiter Emiliano so fun, that, well, we ate there every night. The local bar scene was really fun- it is nice to be disco free for a little bit. Villa La Angostura offers a wide variety of lodging, from nice new cabanas and bungalow type places run by individuals to larger hotel buildings, and even a multitude of hostels. There is tourism info at the bus station that lists hostels and hotels but if you drove into town, it is pretty easy to roll around and check the different places out until you find one to fit your wallet and taste. During the low season it is definitely easy to find a deal. If you have a rental car, some mildly cheaper options exist right outside of town near the base of the road up to the ski hill, and you can do a little more exploring of the spectacular surroundings. If you are heading to Villa La Angostura by bus, most companies, such as Andesmar, have service into town. It is approximately 1800 km from Buenos Aires, 1300 km from Mendoza, and about 83km from Bariloche. 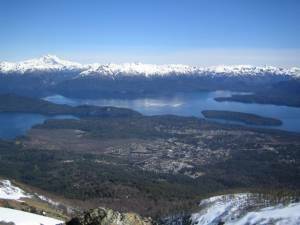 You can also fly into San Carlos de Bariloche airport, which is only a couple hours flight from Buenos Aires, and either rent a car or hop a bus north, or just take a bus the whole way. For this region, a rental car is a nice indulgence. You can check out the ski areas of Chapelco, Bayo and Catedral on your own schedule, and have the freedom to stop in between these destinations. You’ll want to as everything you see is spectacular. Take the Siete Lagos Road, which is a bumpy, rocky, terrible road that is totally worth driving. 4WD is nice if you can get it, especially in winter. Villa La Angostura itself is small and easy to walk around, so you don’t necessarily need a car, but it makes life easier, especially if you are going to be going up and down to the ski hill on your own schedule. Cerro Campanario, You Gotta See This. This page rendered in 0.921 seconds.